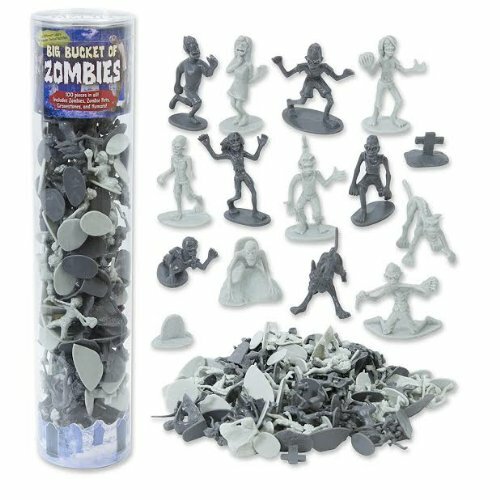 Home › Toys › Zombie Action Figures - Big Bucket Of 100 Zombies - Includes Zombies Pets Gra..
Zombie Action Figures - Big Bucket Of 100 Zombies - Includes Zombies Pets Gra..
Zombie Action Figures - Big Bucket of 100 Zombie - Includes Zombies, ZombiePets, Gravestones, and Humans! : You will LOVE this set of undead zombies. Eachset comes with 100 action figures, each 2-3 inches high. The entire set comesin two colors so you can have awesome undead battles. Use Zombies, tombstones,humans, even zombie pets to make the most amazing playsets ever.